I've mentioned the name of the black pepper I used in the title of this recipe because it's quite simply the best pepper I've ever tasted. If you're a regular reader of this blog, you'll know I have a great love of pepper, so I was delighted when my friend Claire gave me a pouch of Woolworths' excellent crushed Tellicherry peppercorns. With their pungent, warm, nutmeggy, wood-resiny aroma, they're so good that I've been sprinkling them on everything bar the cat. 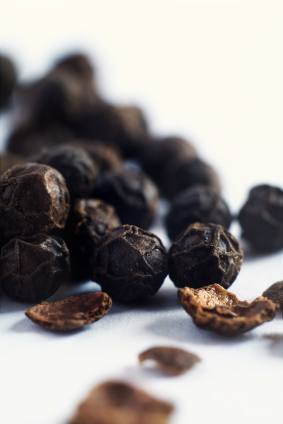 Wikipedia tells me that Tellicherry pepper is the highest grade of pepper, made from the largest, ripest of fruits from Malabar plants grown on Mount Tellicherry. This site says that only the largest ten per cent of fruits may bear the name 'Tellicherry'. In this salad of tender calamari tubes and fresh little broad beans, I've combined the peppercorns with lemon zest and chilli flakes to make a sparky dressing that will definitely give your tastebuds a jolt. If you can't find fresh, small broad beans, use peas, or tinned, drained cannellini beans. I wouldn't bother using older broad beans for this salad, because I'd have to peel them, and that sounds like hard work to me. Any small green leaves will do in this salad (apart from rocket, perhaps, which may distract from the pepper); it's particularly good with fresh watercress. Here, I've used baby beetroot and young mustard-green leaves, which I grow in pots on my veranda. 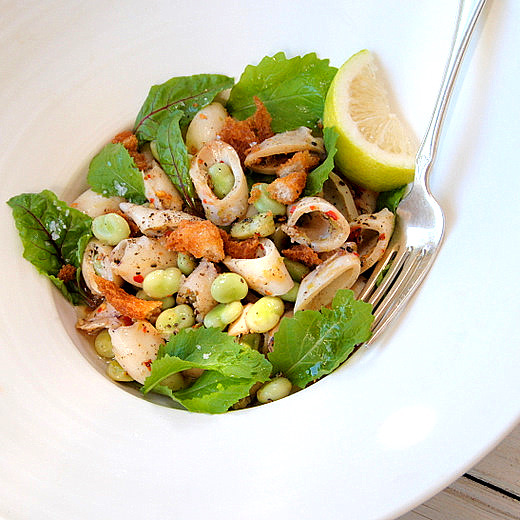 The success of this salad depends on the quality of the calamari you use. Fresh calamari tubes are sometimes available from fishmongers and from Woolworths; you can also buy them frozen, but be sure to buy the smallest, most delicate tubes you can find. 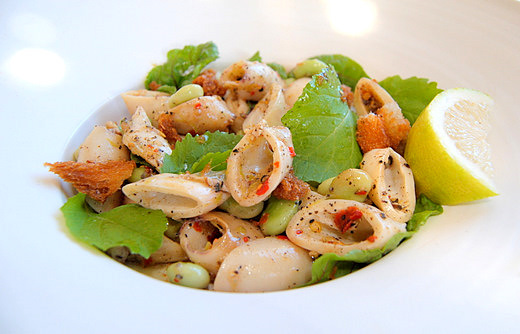 Don't overcook the calamari, as it turns to rubber in seconds. I often add a teaspoon or two of Kikkoman soy sauce to salad dressings, as it has an almost magical ability to round out the flavours and prevent dressings from becoming too astringent. If you don't have Kikkoman brand, leave the soy sauce out. First make the dressing. Combine all the dressing ingredients in a bowl and whisk well to combine. Season with salt, if necessary (the soy sauce is quite salty, so taste the dressing before you add salt). Rinse the calamari under cold water. Trim the purplish bits off the narrow ends of the tubes and slice them on the diagonal into 1-cm rings (or leave whole, if they are tiny). Fill a large pot with water, add the salt and bring to a rolling ball. Cook the rings in two batches. Throw the first batch into the water and cook for exactly a minute and a half. Fish them out with a slotted spoon and place in a colander. Repeat with the second batch (don't throw out the water). Now add the broad beans to the boiling water and cook for a minute. If they are large broad beans, you may need to leave them in a little longer. Drain and rinse under cold running water. Add to the colander containing the calamari and leave to drain for a few minutes. Put the beans and calamari in a big bowl and pour over the dressing. Toss well, and set aside for an hour or two to marinate (don't leave it too long, or the dressing will lose its sparkle). Now make the fried bread. Heat the oil, to a depth of a few millimetres, in a small pot. Tear the bread slices into little tatters and fry until golden brown and crunchy. Drain on a paper towel and season with salt. Just before serving, arrange the leaves on a platter. Tip the calamari and beans, and their dressing, over the leaves, and top with the fried bread. Serve immediately, with plenty of crusty bread for mopping up the juices. Serves 8 as a starter or side salad. Tellicherry is on my shopping list, a must try for sure!!! Love everything about this salad, Jane!! I have never thought twice about the pepper I bought, until I tried the Maldon brand. It's amazing how different it tastes. I've never heard of Tellicherry pepper, I'll have to look out for it. Thanks very much for the soy sauce tip, I'll try it next time. Sounds so divine - perfect for a lazy summer evening with a chilled glass of Sauvignon Blanc! Jane, your posts are always so wonderful as I both learn a new recipe AND usually learn a new fact. Tellicherry wasn't even on my radar, let alone in my vocab, before this. And, might I add, your photographs are incredibly beautiful. Cannot wait to meet you at FBI2011! Thank you for the comments, my friends. @Adele: I've come across Maldon salt, but not Maldon pepper. I'll have to look out for it! @Lori Thanks for visiting my blog! @ Jeanne So looking foward to seeing you at the bloggers' Indaba! @ Thanks Miz Kate. Are you coming to the Indbaba?